When you think about NASCAR most times the words “Saving Fuel” isn’t what most people think of. Most times you think of “200 mph”, “Jimmie Johnson” and “The Daytona 500”. Well not this past Friday night; saving fuel was the big talk on the radio and that’s how the race was won. Saving fuel from the start of the final green-flag run, Brad Keselowski held off Kevin Harvick and Kyle Busch to win Friday’s Feed the Children 300 at Kentucky Speedway. 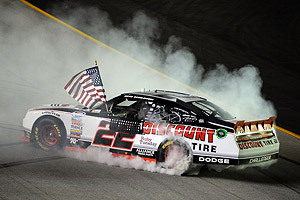 In winning his first Nationwide Series race of the year and the 13th of his career, Keselowski beat runner-up Harvick to the finish line by 1.180 seconds. Busch rolled across the stripe 3.796 seconds behind the winner. Kasey Kahne came home fourth, followed by pole-sitter Elliott Sadler, who took the series points lead from 17th-place finisher Reed Sorenson with his fifth-place run. Sadler leads Sorenson by four points 18 races into the season. Keselowski said clean air was crucial to the performance of his car. “I felt like we were pretty good the very first run,” Keselowski said. “You never know when you have a race-winning car, especially when it transfers from day into night. I certainly felt more comfortable once I got clean air, and I said something to [crew chief] Todd [Gordon] about it. Keselowski, who led a race-high 132 laps, had pulled away to a lead of more than two seconds before Robert Richardson backed into the outside wall on Lap 134 to cause the fifth caution of the race. Taking fuel only, Keselowski was first off pit road, followed by Harvick and three Turner Motorsports Chevrolets, driven by Mark Martin, Justin Allgaier and Sorenson. With all drivers trying to save fuel after a restart on Lap 139, Keselowski again pulled out to a lead of more than one second and held the top spot the rest of the way, as the race ran green for the final 62 laps. Ford drivers Carl Edwards, Ricky Stenhouse Jr. and Trevor Bayne all had to make late pit stops for fuel. Stenhouse, third in the Series standings and 27 points behind Sadler, left the track frustrated. So, Friday’s night race wasn’t nearly as desirable compared to Kyle Busch’s run from Last to First in the truck race and it left many NASCAR fans hoping for a great NASCAR Sprint Cup race and with it being the inaugural race at Kentucky fans were ready!